A rustic firebasket with horseshoe detail and brass firedogs. The basket comprises of an iron frame with 16 horseshoes attached around the frame. The basket has iron bars at the base that are designed to sit on firedogs to raise the basket from the floor. The firedogs are metal with large brass ball finials. The metal base of the dogs have decorative designs. The item is rustic and has signs of use and wear, as expected of reclaimed items. 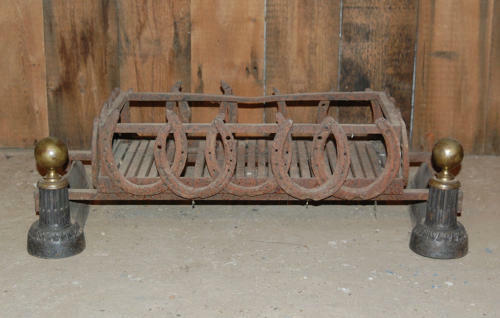 The basket and horseshoes have surface rust and the firedogs have some signs of wear and marks. The iron frame has some slight misshaping to the top bars. The brass has some tarnishing. The fire basket is an unusual item and would be perfect for a rustic or country style interior. The basket would add great character and style to a fireplace.